So today was a tough day. After about a 4 month Battle with a tumor on his leg Bosch crossed the Bridge to be with Sassy. His pal and his buddy. He is now healthy and Happy. I have a broken heart but I know I will see my Marshmallow Boy as I liked to call him again. Run Free my sweet sweet boy. You will be missed by everyone in the family, Jasmine and Snickers too. I know this is short and I haven’t written what my heart wants to say but it is so hard to put into words. 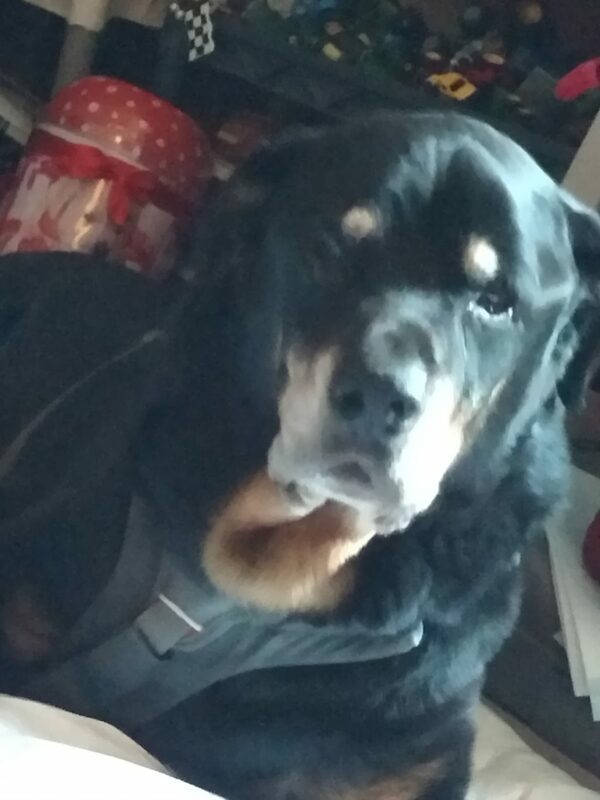 He was our longest living Rottie one month shy of 13. I say he was 13. He had arthritis in his back and feet that was manageable if it weren’t for this crap disease he would have lived a lot longer. I miss you my sweet boy. We all do. My heart breaks for you Michelle…he was a warrior till the end, you did everything in your power to help him. You gave him the greatest gift of all, the gift of setting him free, while your heart was breaking. It’s never easy….not when they are 3, and not when they are 13 – it’s never long enough. Run free, sweet Bosch, healthy and whole. 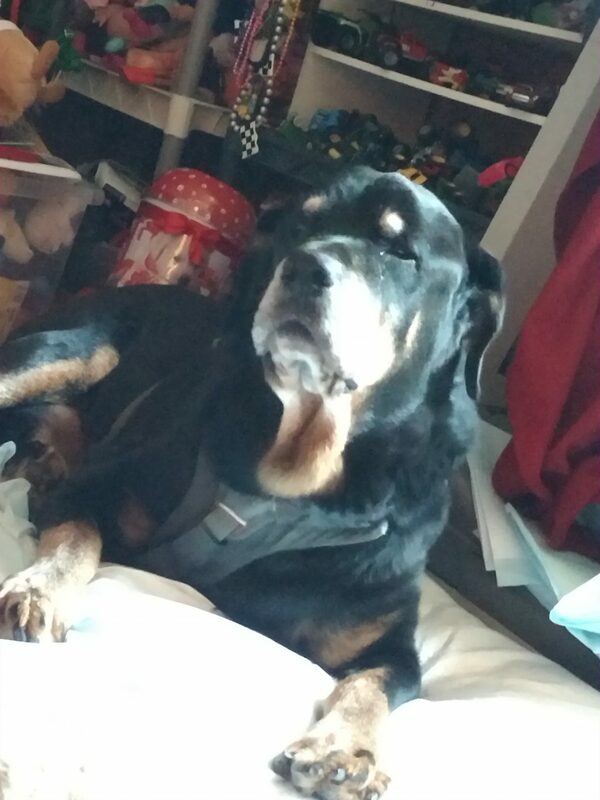 Please tell Nitro I miss him, if you see a handsome Dobie warrior…tell him I love him. 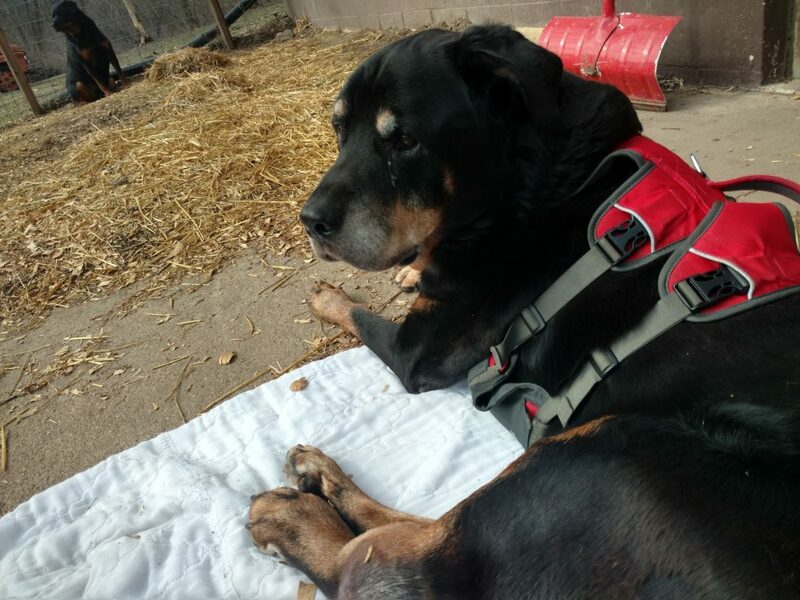 Thank you so much for loaning us Warrior Nitro’s harness. I love you my friend and sister. <3 <3 <3 I know Bosch will tell Nitro you loved him and thank him for the use of the harness that helped him get around. Fly High Sweet Bosch! I’m told Murphy & Cassie to meet you at the Gate. And I’m sure that Sassie was SO happy to see you again! Our other Angels were also lined up to show you around – there’s so much to see. Michelle – I know how much your heart is breaking, how hard this ws for you. Setting Bosch free was not easy, but it was necessary. I hope you felt your Tribe holding you today. Thank you Donna. I felt all of you. Thank you. Truly he was a majestic boy Michelle! Crying with you today. Loving them enough can be so heartbreaking at the end. Giving them that last gift breaks our hearts for sure. But warrior that you’ve become Michelle you loved him enough. Sending you hugs and much love! Fly free Prince Bosch! I know Sassy met him at the gate with many doggie kisses along with all our Angels! So so sorry my friend! I’m so sorry for your loss. I wish there was more to say but I know nothing can help with this pain. Ohhhhh Michelle my heart broke into pieces when I saw this. I am so very sorry. You stood by your boy and did right by him up to his last breath. This is so very hard. We send all our love and condolences to you. You could not have made Bosch more proud of you today. As heartbreaking as today was, he knew you understood he needed to jump out of his failing earth cl6 and run free and fast to join. Sassy at the Bridge. You loved him ecerydaynofnyour life, and he knew your love was strong enough to set him free today. And ohhhh myyyy, he loved you dearly! These pictures are just wonderful. 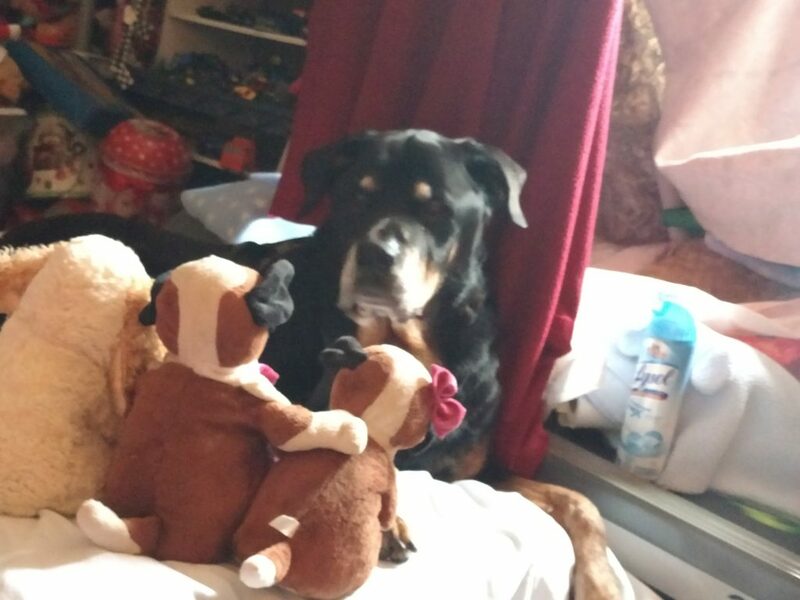 I love him looking at all the stuffies lined up in front of him. His expression is so cute. And the one of the three of them, Snickers, Jasmine and Bosch…very nice treasure. And the video with his beautiful voice leading the choir had me smiling (through my tears). 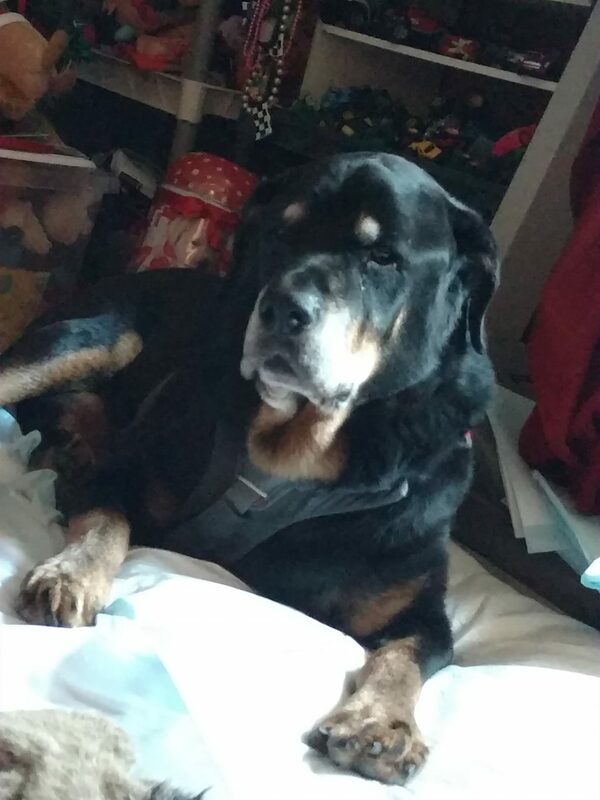 It’s been an honor to get to know this Gentle Giant. For me, hes veen a part of my life for six years now. I’ve so enjoyed all his pictures. 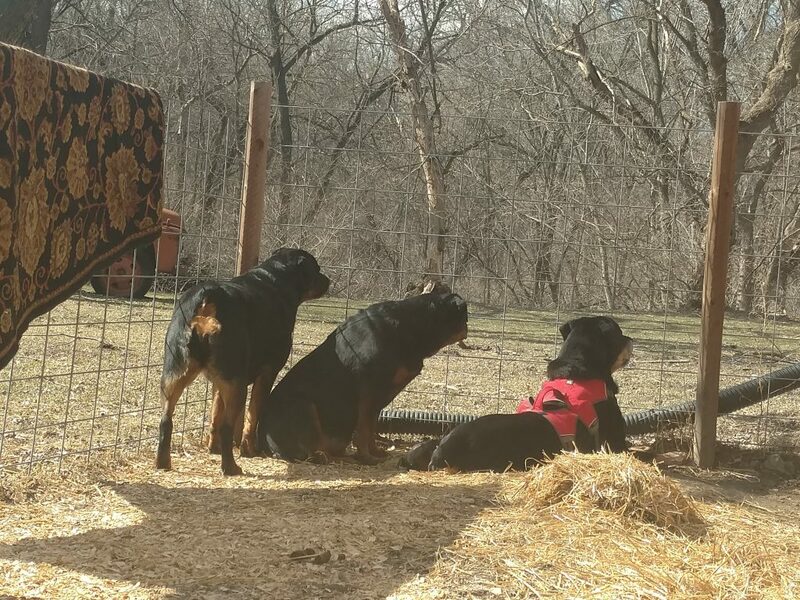 He and Sassy modeling their winter coats, sitting on the slide and “jungle gym” of the kids, helping teach Jazz and Snickers the rules, taking up all the space in your bed…..these are all happy memories that stand out in my mind and make me smile. Bosch, thank you for veing you❤ You will ALWAYS, ALWAYS, ALWAYS be remembered here. Send your Mom a sign when you have time, okay? I know you are busy right now catching up on things with Sassy…..and eating steak and ice cream. Thank you my friend. Bosch was a great presence and it feels so empty right now. I know he is healthy, happy and running and playing. My heart hurts and I know it takes time to heal but man what a presence that is missing from it. I am so very sorry for your loss Michelle. I had hoped so hard that you would have more time together before Bosch would have to go. He is in good company though, I am sure there was thunder with all of the paws that ran over to greet him when he crossed. You are in my thoughts. Sending you a huge hug. Michelle, I am so very sorry to hear about Bosch! I am sure that he and Sassy are having a blast at the bridge! It just hurts and feel so lonely and empty for us when they have to leave us! Thoughts and prayers are with you, my friend! I am so very sorry for your loss!!! Your big Marshmallow won’t be far from you, i can assure you…. but your loss is great and i feel very deeply for you!!! Happy 13th Birthday Bosch!!! You can have as many Pupcakes as you want, Stewie says that they are really good!! Sending you many spirit kisses! Michelle i am sending you a massive hug and hope that you feel the comfort from your friends!!! Thank you Petra. It means a lot. I’m so sorry to hear that you lost Bosch. He was a magnificent presence that you will never forget. He was so lucky to have you as his mama. Sending hugs to you.